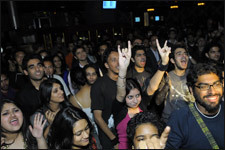 Alter Egoz Live At Hard Rock Cafe is an event that took place on 24-Jun-2010 in Hyderabad. This week's Thursday evening gig at the Hard Rock Cafe will feature the city's popular rock band Alter Egoz performing live. The members of the band are Lokhi, Vijay and Anshu on the guitars, Badri on the drums, and Ajay and Bhargavi on vocals. The band collectively has around 25 years of performing experience, and has been through quite a few reincarnations. It started off as 'Katalog' in 1986, and reformed as 'Zeus' in 1990. It continued as 'Zeus' till it changed to '40-Year Itch' in 2000, and concentrated predominantly on the musical trends of the music of '50s and the '60s. It became 'Alter Egoz' in 2001, and has been inspired by the newer trends in music (a shift back to rock, blues, alternative and reggae) since then. Originally, all their 6 compositions were made to English Lyrics, but due to a possibility of a few of them threatened to be used for films, they have made them bi-lingual. For example, Conscious - Shakti and Belly - Naya Naseeb are in English as well as Hindi. Please contact the venue at 6660-4242 for further details. Be the first to comment on Alter Egoz Live At Hard Rock Cafe! Just use the simple form below. fullhyd.com has 700,000+ monthly visits. Tell Hyderabad what you feel about Alter Egoz Live At Hard Rock Cafe!